We’re all familiar with stories about today’s most common business challenges – vigorous competition, digital disruption, empowered customers, and changing social norms. But, while nearly every business leader faces these challenges, only a select few are really thinking and doing things differently than their competitors. In the CRM world, these are our Mavericks. Their stories and how they’re using CRM for business transformation give us insight that we’re delighted to share with others who are keen to challenge the status quo. Today’s challenges quickly turn into yesterday’s achievements. Mavericks keep their sights on how things might change even though they have urgent problems to solve right now. The old business saying of, “We don’t know what we don’t know yet!” is true, but it’s also an excuse not to think ahead. It’s not a complicated concept but it does require some bravery: Mavericks prepare for inevitable change with open thinking and open technologies. Most technologies have limitations. Many are not obvious at the initial decision-making stage but become clear as needs change – sadly, often not very far into a long-term contract. Mavericks look ahead to understand what limitations might become an issue over time and plan to avoid painful compromises. Pace varies from one organization to another. Mavericks want to decide on the right pace of change for their technology landscape. They want to evolve when there’s a good reason, rather than being forced to upgrade frequently on vendor schedules which can cause disruption, new risk and – let’s face it – irritation. One-size-fits-all is something we don’t hear Mavericks talk about in a positive light. Out-of-the-box functionality is valuable to a point, but flexibility and customization are factors that all our Mavericks value highly. CRM should fit snugly with the organization and evolve with it – it’s a business platform that needs to integrate openly with other systems and provide fertile ground for all the business ideas yet to come. Anyone who thinks they have all the answers is probably a genius, or deluded, or perhaps both. Mavericks know the future will present new complex problems, so again it’s critical to keep an open mind and keep asking questions. It might be initially satisfying to sign up to a simple ‘per-user’ CRM solution, but Mavericks know about the hidden fees that surface down the road for things like integrating more, accessing advanced features and storing data. These unexpected costs inevitably arise when an organization gets its teeth into CRM – which is the whole point. If people don’t use CRM, it will fail. Mavericks pay attention to the human side of CRM implementation, not just the technology. They want the flexibility to build CRM around their users, and they also tend to invest in strategies and support for cultural change. 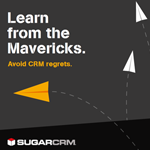 SugarCRM is the choice for Mavericks. It’s the enabler for sophisticated, customer-centric CRM and it’s designed for what proprietary solutions shy away from: change. Sugar can be easily shaped to fit around the organization and its customers, and very importantly its users – which means adoption, which means success.